Are you ready to streamline your business, get more organised, and maximise efficiencies? Whether you’re a solo business operator, or have a growing team of talent, software and systems are going to be your friend for achieving each of these objectives. Since we first started in business, (over 13 years ago! ), the amount of tools and SaaS products on the market has exploded. Where we once favoured whiteboards, notepads (yikes.. pen and paper) and spreadsheets for keeping on top of our to-do lists, these things are almost laughable now compared to the sophisticated range of software we now have to keep on top of everything from client briefs, through to social media management. We’re not talking about the professional tools that we were trained up with like the Adobe Creative Suite. These tools are all newer things we’ve discovered, or built, since starting our business. Let’s get started on our list of top tools. Copirite has been a graphic design agency on the Gold Coast for well over a decade, so we’re quite well established with locals and national clients alike, as well as a smattering of International clients too. So we’re super busy, and generally have well over a thousand in-coming job requests every month, with our peak periods getting much higher than that. This is how we keep things under control for our clients and make them feel like nothing is impossible! We’ll start with our hardest online worker; our CRM. We’re lucky enough to have in-house developers who have built this amazing system (hi there Rob!) over the best part of the last decade. • If you’re in an organisation or have a wide range of designs Copirite have created, you can also have a ‘Catalogue’, where you can easily re-order jobs for multiple outlets, with multiple users. As an internal development, we’ve been approached by our larger clients on many occasions to include custom items for their groups of outlets and venues. These turn Copimaker into their own ‘Portal’ for marketing and design, and provide efficiencies for them internally. • Dispatch Scanning – each team member in our Print & Dispatch centre is equipped with Copimaker on their phones for scanning in jobs with barcodes, and also viewing status of any upcoming jobs nearing dispatch. Quite frequently we have clients ordering projects several times a week and if they reach production at the same time, our team can combine the deliveries to save on freight charges. • Purchase Orders & Inventory Control – We can keep tabs of our own stock levels (various papers & vinyls, inks etc) as well as any client warehoused stock, with alerts for capturing low levels requiring replenishment. • Courier Tracking – Implementation of each of our major freight suppliers tracking from each point, directly into each job record. Copimaker is a true work horse that has been one of our greatest investments, and we can’t imagine being without a high quality CRM. If you’re looking for an off-the-shelf option, there are a ton to check out including Oracle, Freshworks, Copper and SalesForce, all with unique features. 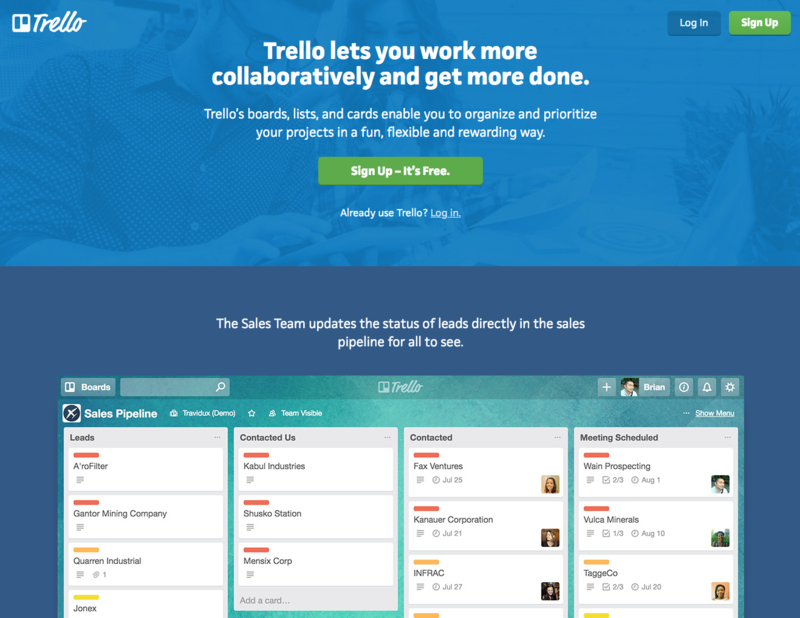 If you’re smaller, check out Trello, another top tool in our list at number 5. Money in, money out. With our full integration of Xero with our CRM, we’ve managed to cut out days of administration every month. With each job pushing out relevant data from the job number and title through to line by line itemisation to invoice format in Xero, and also data pushing back into Copimaker to advise of overdue accounts, many of the uncomfortable scenarios of advising clients of credit status can be avoided. We wrote a bit more on our changeover to Xero a few years ago, and can say we’ve only grown to love it more and more. Xero has a really low learning curve, and has some aspects that are even fun to use! Once hooked up with your bank accounts you can easily reconcile your accounts in a fraction of the time it used to take. And being cloud based, you can use it anywhere, anytime, and they also have a handy app. Xero is a paid application that isn’t on the cheap side, but in our opinion it’s worth every penny for the amount of time it saves us. 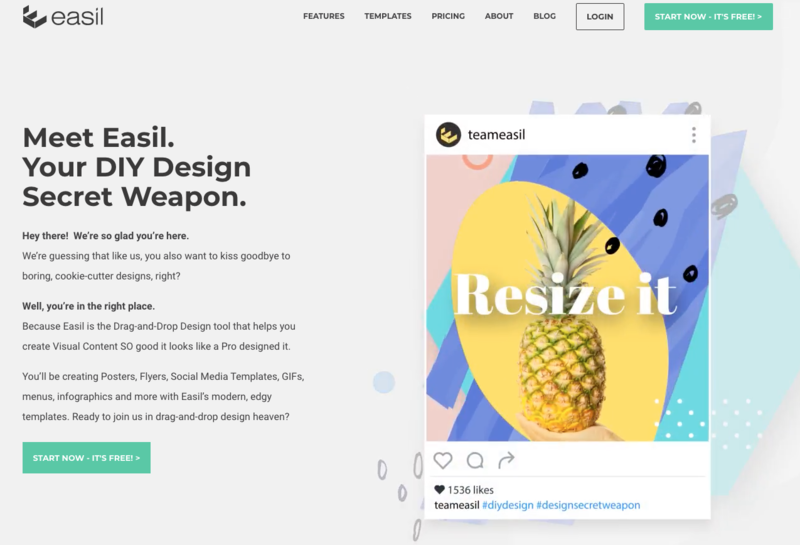 It may seem odd that as a Graphic Design studio that we recommend a tool that allows ours clients to also design, potentially reducing our income. We don’t view it like that though, and know there will always be a place for our talented (and still growing) design team. This online design tool is used by both our administration team, as well as our graphic designers, to create artwork templates that our clients can edit themselves. It’s a strategic part of our growth plan at Copirite, which focusses on allowing our graphic design team to be creative, instead of working on revisions to clients previous artworks. • Brand Kits – A single home to store a brand’s colour palette, corporate fonts, brand imagery and logos. This is a huge timesaver, and we love the fact that it eliminates the need for various dropboxes, and other cloud integrations, and is really a digital asset management system (DAM) that can be used between us, and our clients. • Document Restrictions – Within each bespoke template we create, we’re able to lock down various editing abilities to ensure the integrity of the design, from preventing a colour change on a heading, to only allowing certain images to be swapped out. This is our all-time favourite feature, as it means our design crew can design, and then share to edit, without the heartache of a client destroying the work that was creating by changing a font selected to fit with their brand to something like, comic sans. It’s also (reportedly!) less stressful for our clients when they’re presented with only the options that they should be working with. After all, they’re not designers, but simply wanting to streamline some aspects of their graphics creation process. We also use it to create collateral for brands that want to lock down and protect the IP in their point of sale graphics, but need to distribute out to franchises or venues to edit themselves, but are not graphic designers. • Integration with our CRM, Copimaker – Our clients that use both Easil and Copirite for their creative can combine their portal into a single log-in, allowing them to order their POS items through Copirite and keep the order history and accounts in a single space. There’s a generous 30 day free trial of the Plus plan included with every sign up, and on on-going free plan, but we think the AUD$9 plan per person provides great value, with full functionality and a huge range of included templates and stock imagery. Slack is an instant messaging platform for internal team communications, and is slowly but surely replacing email for us. We have various channels set up for between department banter, sharing files and quick reviews of design drafts, and it can also be used to send direct messages to team members. Slack also has a generous free use option that allows a small amount of file storage, multiple team members, and a set amount of integrations. We have ours set up to alert us if certain events happen in other applications to save us from having those all open to monitor. You can sign up for Slack here. Outside of our CRM Copimaker, we adore Trello for keeping on top of a wide variety of client projects and planning such as websites. It’s a super easy to use, drag and drop card system that you can use on all devices. We internally link each job from our CRM to a ‘board’ for each project that allows us to easily Create Lists, for each stage of the site development; from inspiration on UI, to receiving content documents and imagery, through to checklists for mandatory inclusions on each site (eg Google Analytics, Yoast setup for effective SEO, Domain registration, staging server setup) which are stored on ‘cards’. Trello has a ton of options available on it’s free plan, or you can upgrade to enable a whole ton of ‘Power-ups’ that allow you to integrate with other applications to further streamline your operations. It’s a great solution for managing projects when you need to collaborate with staff and don’t want or have the need for a full blown CRM. Combining social inboxes for ourselves, and also for the clients we manage, was a game changer. AgoraPulse allows you to reach ‘Inbox Zero’ in record pace by having a single login for your multiple social media accounts, as well as the ability to ‘Listen’ and monitor your keywords and phrases on social media conversations, as well as your competition if need be. 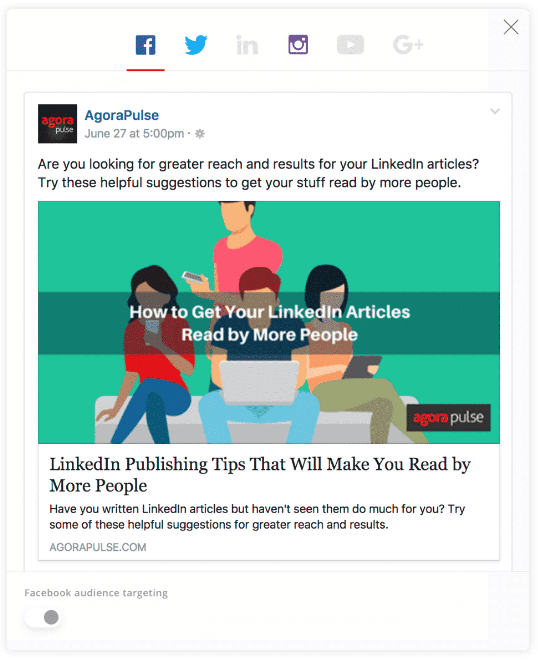 AgoraPulse is also a scheduling tool for your social channels with handy publishing options for evergreen content, and a cool preview of what posts will look like fully formatted, so we’re never caught off guard! We primarily use ActiveCampaign for email campaigns and automation, for both ourselves and our clients campaigns. It’s simple to set up a sequence of emails to be sent to clients based on either timeframes (for example following the download of an eBook, we can send some bonus tips in a sequence over several days/weeks), or can also work with triggers supplied from other application integrations. ActiveCampaign’s email campaign creation is a simple drag and drop function with heaps of formatting options and also the ability to save regularly used items such as button styles for call to actions, so they can be quickly and easily re-used. We love the reporting included and that it’s super easy to resend a campaign to those contacts that haven’t open and read the message, increasing open rates without much effort! ActiveCampaign also has a bunch of other features like SMS, Coupons, Referrals, and other eCommerce functionality. You can start using it for a free trial here. 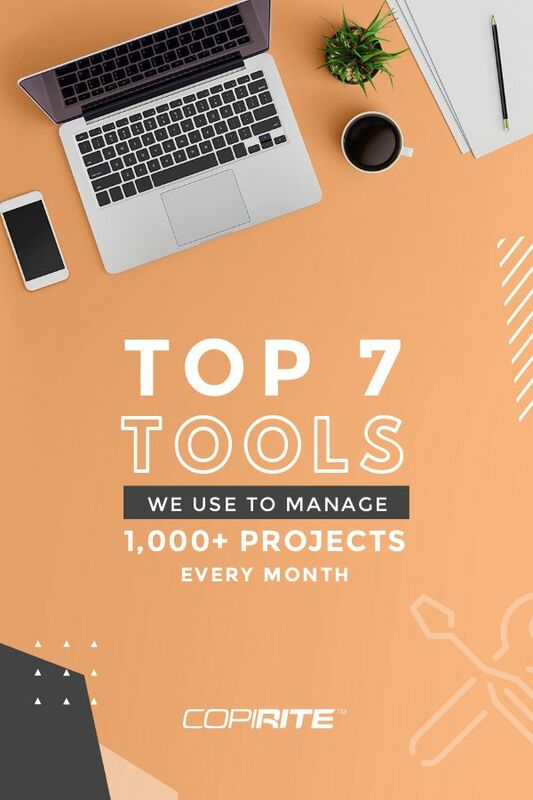 So there you have it; our seven top tools – or our secret weapons – for running a tight ship at Copirite. They only enhance having a wonderful team, which we’re lucky enough to have. Have you tried any of these tools? Let us know your favourites and what you use to keep your business running efficiently.